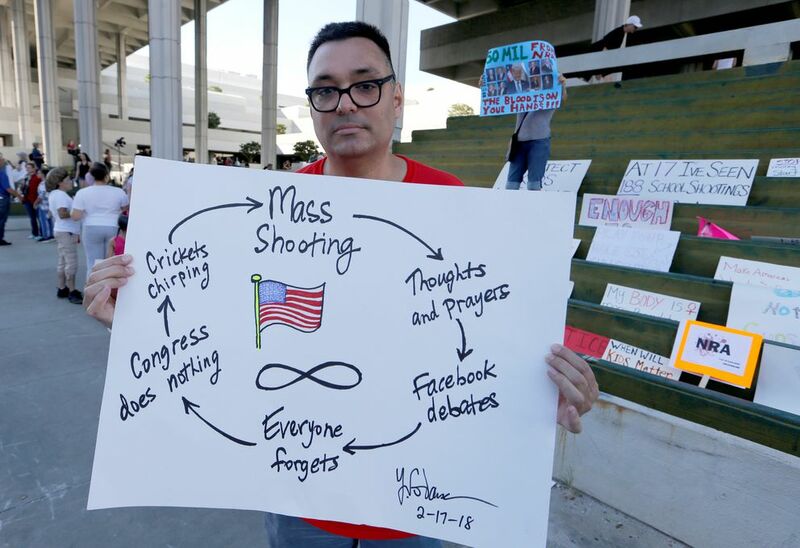 TAMARAC, Fla. — The shooting was all over, but the emotional reckoning had just begun, and so on Saturday the teachers of Broward County in Florida packed their union hall to discuss what it meant to have become the nation's human shields. 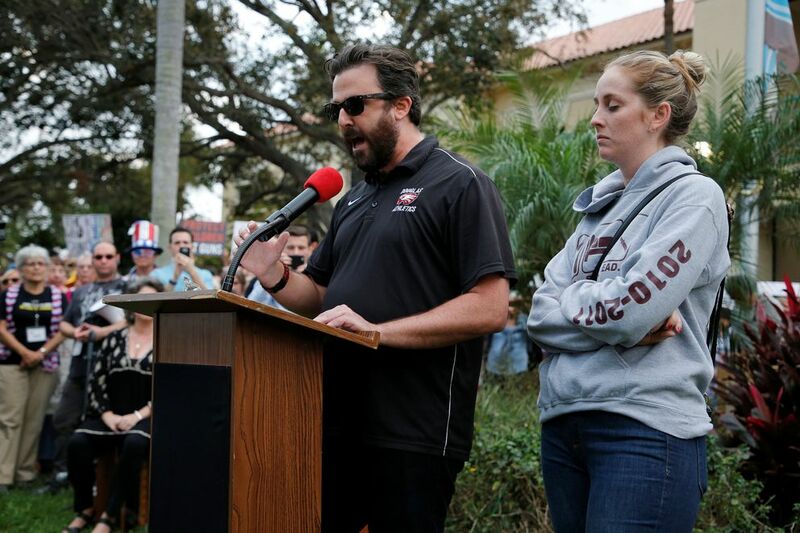 "Last night I told my wife I would take a bullet for the kids," said Robert Parish, a teacher at an elementary school just miles from Marjory Stoneman Douglas High, where a former student killed 17 people, including at least three faculty members who found themselves in the line of fire. Since the attack on Wednesday, said Parish, "I think about it all the time." Across the country, teachers are grappling with how their roles have expanded, from educator and counselor to bodyguard and protector. They wonder if their classrooms are properly equipped, if they would recognize the signs of a dangerous student and, most of all, if they are prepared to jump in front of a bullet. In the past few days, teachers wrote to Congress, urging bans on assault weapons, and to state lawmakers, seeking permission to carry firearms to school. They attended local protests and reviewed safety plans with students. And in the evenings, they spoke with friends and family about an excruciating reality — that teachers, who once seemed mostly removed from the life-or-death risks faced by the ranks of police officers and firefighters, might now be vulnerable. "I visualized what it would look like, and it made me sick," said Catherine Collett, 28, a sixth-grade teacher in Northern Virginia who has spent recent days running through a thousand violent scenarios. "Could I empty out the cabinet and throw out the shelves and put kids in the cabinets? Is my better chance just barricading the doors? Can I move furniture that fast? Do I ask my kids to help me?" "When I started teaching I thought I was just coming in to teach," said José Luis Vilson, 36, a middle school math teacher in New York City. Now he has come to view himself as a first responder, too, and added that instruction on topics such as conflict resolution and first aid would be useful. "I never had any of this," Greene said. "We had the basic fire drills." Nowhere was the conversation among teachers more intense than in Broward County, where Stoneman Douglas is one of more than 300 schools, and Nikolas Cruz, charged in the shooting, had been among the district's 270,000 students. Laurel Holland, who was Cruz's 11th-grade English teacher at Stoneman Douglas, said teachers in big public schools cannot possibly be expected to look into every student's background to know if they have long been troubled. The year that she taught Cruz, she had more than 150 students, she said. "There's not enough time," she said. In the case of Cruz, she said, it was clear something was wrong. "He didn't work and play well with others," she said. "I was frightened." Inside the crowded union building on Saturday, educators held hands and shouted "Union strong!" before getting down to business. "I'm curious to know, out of the people here, how many Nikolases they have at their school?" said Elizabeth Sundin, 48, a teacher's assistant. "Because I have one at our school." Outside, in the balmy Florida night, Parish, 51, of Broadview Elementary, was wrestling with the question of the class door. When an armed attacker begins to prowl, and a student is left in the hall, "Do I let the kid in, and maybe the gunman behind her?" he said. "Or do I not let them in and save the whole class? That's a decision I can't make." 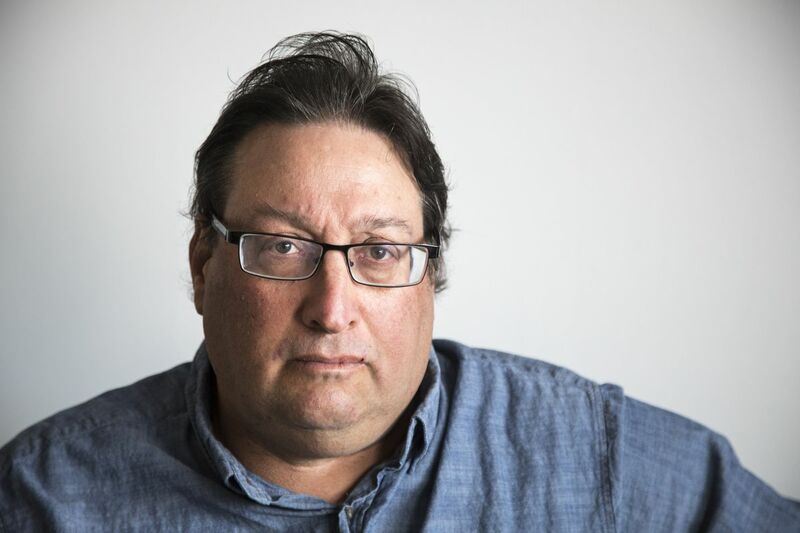 "I teach the Holocaust," he shouted at the rows of exhausted teachers. "I taught them," he said of his students, "about a man by the name of Janusz Korczak who walked into the gas chambers with his children because he refused to leave them. And after this happened my kids are sitting outside saying, 'Mr. K, would you give your life for me?'" Klasner said he would — of course. "I said, 'Did you even have to ask?'" "I've been having a lot of difficulty sleeping," said Suarez, whose four children have been urging her to leave the profession. "I keep hearing kids screaming and gunshots in my head." Jess Bidgood contributed reporting from Boston, Patricia Mazzei from New York, Neil Reisner from Fort Lauderdale, Fla., and Kitty Bennett from St. Petersburg, Fla.